Last week, we covered how you can configure backup on Azure VMs using Azure Quickstart templates. In this blog post, we will cover how you can customize the VM that will be created as part of restore operation from Azure backup to match your restore requirements. Azure Backup provides three ways to restore from VM backup – Create a new VM from VM backup, Restore disks from VM backup and use them to create a VM or instant file recovery from VM backup. While a creating a VM from VM backup creates a restored VM, it will not let you customize the configuration from what is present during backup. If you want a test restore or spin a new VM with a different configuration, you can use restore disks and attach those disks to a different VM configuration using PowerShell. Today, we are happy to announce a feature which provides a customizable template to be deployed along with restore disks option which lets you customize the configuration for restore VM. You can use restore disks option to customize parameters which are not possible with create a new VM option as part of restore process. Create VM option will generate unique identifiers and use them for some resource names to guarantee a restored success. If you want to customize or add new parameters as part of restore process, you can restore disks and use the template generated as part of restoring disks to customize the restored VM as per your requirements. This will also enable you to create VM with your choice of configuration from restored disks more seamlessly or help you to restore a VM to different network settings to test restore periodically at your environment. 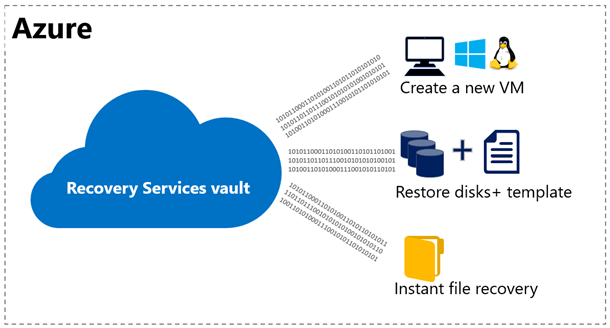 Once you trigger restore job using Restore disks option, Azure Backup will copy data from its vault to storage account selected. Once this job is completed, you can go to corresponding restore job to find the template generated. This will be stored under parameter Template Blob Uri. Using the path mentioned, go to specified storage account and container, to download the template. 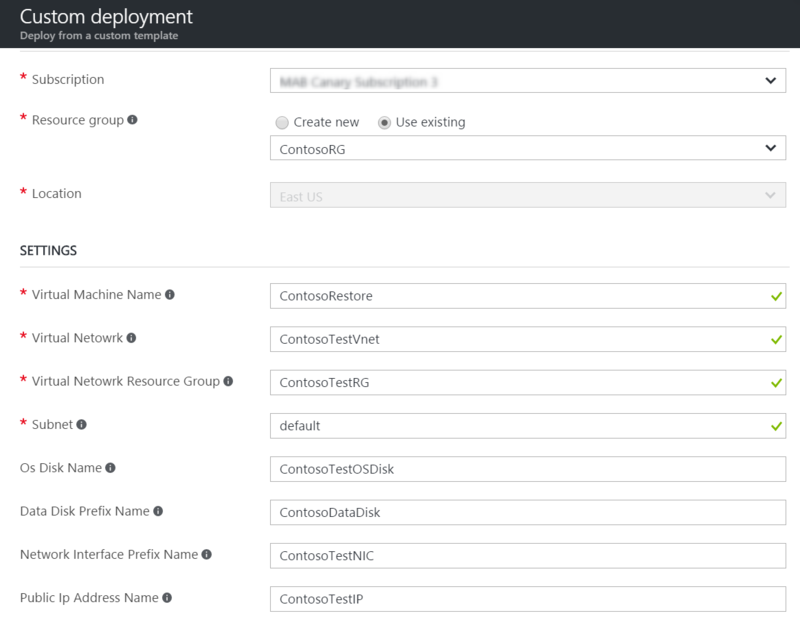 Once downloaded, you can use it in Azure template deployment to trigger a new VM creation. By default, template will have few parameters like Vnet Name, Public IP name, OS Disk name, Data Disk name prefix, NIC name prefix and Availability set option(only available if your original VM is part of availability set). If you want to specify a different configurations parameters, edit the template and submit the template for deployment. Template will be provided for all non-encrypted standard and premium non-managed disk VMs and we will add support for encrypted and Managed Disks VMs in coming release. Please let us know your feedback at azurevmrestore@service.microsoft.com.